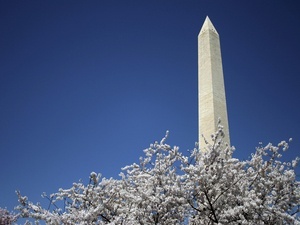 The Washington Monument is one of the most iconic structures in the world. The 555-foot natural stone obelisk gleams bright and white above all other buildings in the District of Columbia, and the world. It is, after all, the tallest all-stone structure on the planet. But upon further inspection, while it may be all stone — marble underlain with blue gneiss and granite — it is definitely not all one color. It’s actually three. Constructed to honor the first President of the United States, George Washington, it was dedicated in 1885, almost 40 years after the cornerstone was laid in 1848. From 1854 to 1877, work halted on the monument due to a shortage of funds and then the Civil War got in the way. That stoppage is why it is lighter at the bottom, which was phase one, and darker at the top. According to the National Park Service, when construction began, stone was mined from a quarry near Baltimore, Maryland. But during that 20-plus year layover, the quarry had closed up shop, so stone was brought down from Massachusetts. But after only a few layers were added to the existing monument, it was obvious that the new marble had a brownish color. They decided to live with the “brown-streaked beltline” one-third of the way up the monument and went back to Baltimore to a different quarry to complete the final two-thirds of the obelisk. It still didn’t match the bottom third exactly, but the builders thought it was close enough. So, the next time you see a photo of the Washington Monument, or better yet on a visit to the nation’s capital, take a good look. You’ll see the three distinct stone colors of the all-stone structure reaching toward the sky. And now you’ll know why.